Not just a peacock, but a great resource as a pure-bred competitor, or as an "Improver" for your sport breeding. 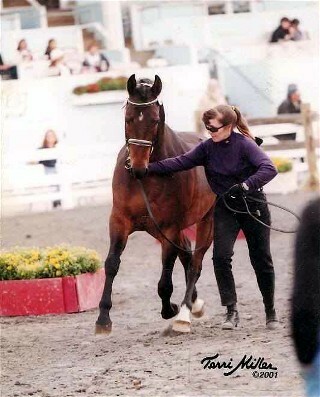 Our domestic Saddlebred is surely one of the most under-appreciated sources we have for sport success. Many of us have been blinded by the dazzle of the modern day show Saddlebreds, those horses with exaggerated high stepping motion and abnormally high head sets, which has resulted in us missing the big picture. Fortunately for Olympic style sport horse breeders, this show strain is but a small segment of the breed (20-25%), and there are plenty of Saddlebreds that have retained the original versatile talent, and it is those gifted athletes we want to address. We can recognize them by their conformation. The Saddlebred is but one of several light saddle horse breeds that descend from the American Saddle Horse, a breed of exceptional beauty and talent that sprang from the saddle horse version of our original Running Horse breed. The first American Saddle Horse registry opened in 1891, but the breed goes back to the Plantation Horse movement which came about when continuous crossing in of English Thoroughbred in the late 1700s and early 1800s on our native Running Horse was causing the natural gaitedness soundness and the sweet personality of our original race-saddle horse breed to go latent. About 1800 alarmed breeders stepped in to save the saddle horse traits of our first sport breed and the result was the Plantation Horse, which was later called the American Saddle Horse. Although breed standards were in place before this, the first documented performance test was a horse show in Kentucky in 1817. The parent breed: the American Saddle Horse was both a prized saddle horse and a valued Hunt horse, with a tremendous jump. They were a comfortable, willing and stamina loaded companion, and later a show horse. Some of the early ones raced also. They made excellent cavalry mounts and served in the Civil War with distinction. The American Saddle Horse was also part of our Hunter Horse tradition and it excelled at cross country and jumping. They were a valued part of our Remount breeding program which opened in 1910. The genetics of the breed come from the American Running Horse base with later additions of Morgan, American Trotter and Thoroughbred. 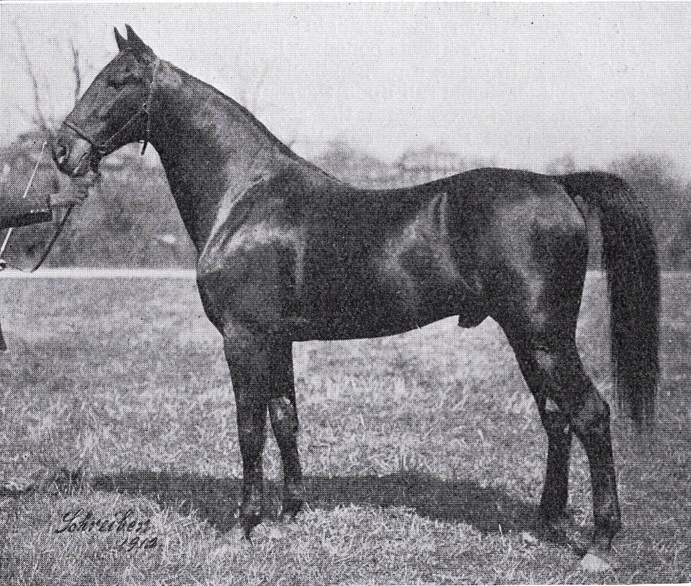 The Saddlebred strain retained the original registry when other branches like the Tennessee Walker split off in 1935. 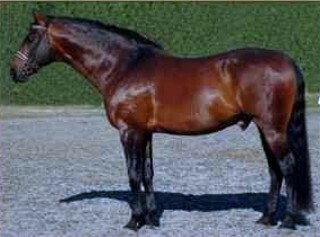 The Saddlebred had a breed standard of five distinct gaits, and after a short time it reduced the foundation stallions to just one: Gaines Denmark ASA. Breeders search far and wide looking both abroad and domestically for an elegant horse with athleticism, superior movement, conformation and rideability, yet it has been right here all along. Saddlebreds--in the old style mold are just the thing for our modern Olympic style sports, and they are winning especially at driving, eventing and dressage today, but are also seen in jumping, hunter and even western disciplines. Why chose a Saddlbred? They have great legs and feet, they have perfect saddle horse conformation and are naturally forward moving and collected, plus they are willing and friendly. You need not wear spurs, nor spend hours upon hours schooling them in complex movements, as they piaffe and passage naturally, and they have beautiful pure gaits. Further, for breeders who are looking for an improvement strain that will lighten up their stock and at the same time provide movement with suspension and collection, or bring in a willing temperament- then you need not look elsewhere- our Saddlebred is the right stuff, and it is pre-potent, so it will upgrade whatever you breed it to. Another gifted Saddlebred dressage sire is highlighted in North American Sport Horse Breeder, Flight Time Gold SB has a full chapter devoted to the story of his career along with his pedigree and its analysis. Those of you who may be interested in current Saddlebred sport stock suitable for your sport disciplines or for breeding should visit Saddlebred Sport Horses. You will find many useful articles and discussions there and current horses for sale. "WCG Bloodlines in the Sport Saddlebred"